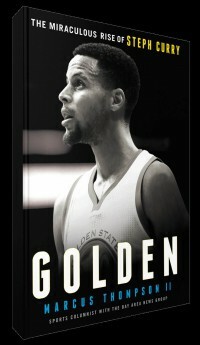 Emily Parker spoke with Marcus Thompson, reporter, sports columnist, and now author of 'Golden', about the faith and skill of basketball star Steph Curry. Emily: Tell me a bit about yourself, Marcus. You're a reporter and sports columnist, so tell me what life looks like for you day-to-day. Marcus: I guess the most consuming part of my life is my 10-year-old daughter. I've been doing this for a while, for about 20 years now. I've been covering professional basketball for maybe 15 of those. So my wife and I have a good rhythm, but now my daughter is 10 and she's older, she wants to be involved. I'm managing her energy. It's been a bit of a different twist. Typically my day is: I watch basketball, I go to practice, I do a lot of interviews, I try to think of unique story angles and ideas; I try to get people to tell me information that they don't want me to know and I write articles about it. I also cover professional football, and professional baseball as a columnist. I pretty much write about everything. The Warriors are the dominant team around here, but there are some other teams, San Francisco Forty-niners included; and the Colin Kaepernick situation has all taken over our lives, the protests and the anthem, so it's pretty busy around here nowadays. Emily: What made you want to be a reporter and sports columnist? Marcus: This is a funny story. When I was in high school, I played on a basketball team, but I wasn't very good. We played a really rubbish team and I got a chance to play a lot. I had a really good game. I waited for the school newspaper, so I could see about my game and get my little news clippings, because it was my first time having a good game, but there was nothing in there. So I go into the newspaper office. I'm angry and I'm trying to get an explanation of why they didn't write about my one good game. She told me they didn't have a sports writer and she offered me, "Do you want to be our sports writer?" I was like "Yeah, I'll do it." I had the mind of thinking I'll write about my own games. So I have a good game, then I'll write about it. It ended up being so much fun; it kind of took off from there. I read sports a lot. At some point, thankfully it was young enough, that I realised my professional athlete dreams weren't going to happen. It just seemed like a natural way for me to be around sports, which I love, and also develop this love for writing. It was a natural fit. I wasn't good enough to play professionally, so I figured I'd write about it. Emily: When you were growing up did you have any heroes that you looked up to in the sporting world? Marcus: Michael Jordan in basketball, the die-hard Michael Jordan maniac. Jerry Rice in football because he played for the Forty-niners and I was a Jerry Rice nut. Rickey Henderson was my baseball guy and that was largely because we went to the same high school. We're from the same city, Oakland, California, so you had to be a Rickey Henderson fan. Those were my idols coming up. Also, Mia Hamm I used to love Mia Hamm, she was a great soccer player. She got me into soccer, and I was a pretty die-hard WNBA, Women's basketball fan and my favourite player of all time was Diana Taurasi. I still love her to this day. Emily: Do you remember the first time that you heard of, or met, Steph Curry? Am a fan of Steph too. How is faith viewed in our modern society?